Oriental Art Part 2 – Welcome! My first oriental swap of the year was the Dragon Mingle. Since I had such a fun time being sick in January, my card got created and mailed a day late. 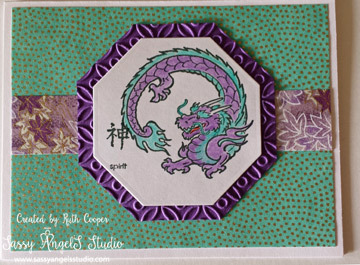 I decided I wanted to create more in one of my favorite color combos this year, green & purple. I stamped the dragon & colored him in with good old Crayola pencils. I dug around in my smaller oriental stamps for a word that I thought might fit. I have decided I really need a couple of stamps that say “fierce” so if you know of any, let me know. “Fierce” in kanji would be awesome. Refresh your spirit this week with a little bit of time to be creative.